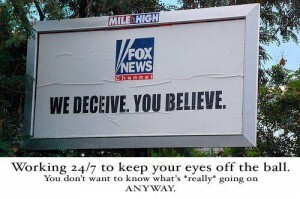 Students of the US mass media already know that Fox News puts the ‘crap’ in ‘crapulent,’ as in you have to be drunk to believe the incredible amount of propagandistic slag — misdirection, guilt by association, half-truth and outright deception — that emanates daily from Roger Ailes’ neoconservative cable megaphone disguised as a useful outlet of unbiased information. But Roger’s pet monkey is losing audience as economic reality worsens for the benighted ignorati that still take Fox’s Red River of pig slurry seriously. After all, it wasn’t the ‘dirty hippies’ or socialists or ACORN that is foreclosing on their homes, cutting their pensions, and shifting their jobs overseas — it’s Roger’s pals on Wall Street and in the corporate suites of America. Adding to that, Big Boss Rupert Murdoch is having his problems, both with Fox News parent News Corp. investors wanting to dump him, and the UK government out to prosecute him since he severely antagonized Queen Elizabeth II by illicitly spying on her relatives. But then the final slap in the kisser happened as, according to a Fox poll, a majority of Fox News viewers agree with the OWS Movement the Foxifiers had spent weeks trying to ridicule and vilify out of existence. It must be as jarring a prospect to Roger as human eyes witnessing his bulk stuffed into nothing but a skimpy Speedo, the idea that a large chunk — 69 percent — of the bottom-feeders Fox caters to have finally woken up to who’s at fault for their misery. The worm, so to speak, has turned. Boy, that’s gotta hurt — all that ‘good’ propaganda down the drain. But that poll was from Oct. 7th; surely things have changed since then? No, as Mark Howard outlines, the Fox sleaze and slime directed against OWS still isn’t working. 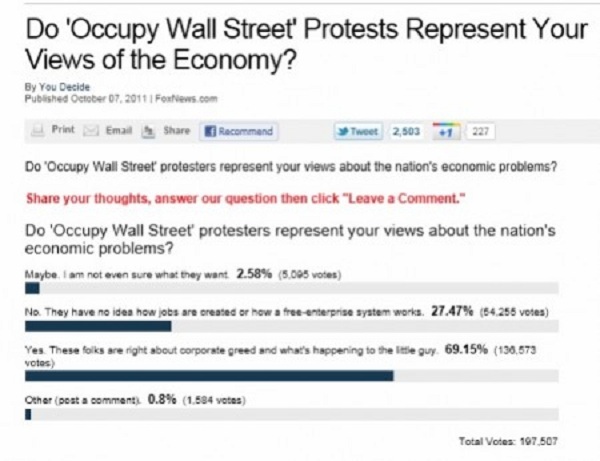 Another day, another Fox News attempt to smear the Occupy Wall Street movement. This time they’ve resurrected their favorite bogeyman, ACORN. 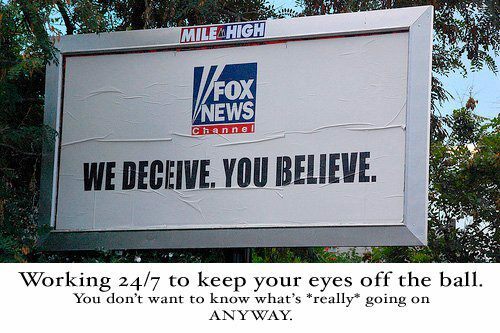 Another day, another Fox News attempt to smear the Occupy Wall Street movement. Speaking of hippies, here’s an excerpt from a 2007 Mark Morford article that’s relevant to the 99 Percenters in the streets today — turns out, the ‘hippies’ of the ’60s were right! – Mark Morford, “The Hippies Were Right!” San Francisco Chronicle, May 2, 2007. This entry was posted in 1 Percent, 99 Percent, Christopublicans, Conservatives, Corporations, Corruption, Economy, Idiots, Media, OWS Movement, Politics, Quotes, Republicans, Teabaggers, Wall Street, Wingnuts and tagged AlterNet.org, Fox News, Fox Poll, Hippies, Mark Howard, Mark Morford, OccupyWallSt.org, Roger Ailes, Rupert Murdoch, We Are The 99 Percent. Bookmark the permalink.